On Tuesday, Day 8, students bravely went out into the general public to test their ideas. By bringing the Breakers designs out into the people they designed for, feedback was received alongside a strengthening of communication skills. Testing included asking questions like how might we improve? What worked? What are the users’ concerns? For instance, students Jordan Tran, Ely Hao, and Nabil Khan had created CAD blueprints and a rough model for “Cut/Paste”—a modular housing company that turned up-cycled shipping containers into affordable and attractive tiny housing. By focusing on human-centered design and investigating people of Portland’s opinions, Cut/Paste discovered that potential users were wary of the stigma of affordable housing and that sturdy materials were a concern. They were able to refine their idea and business plan. 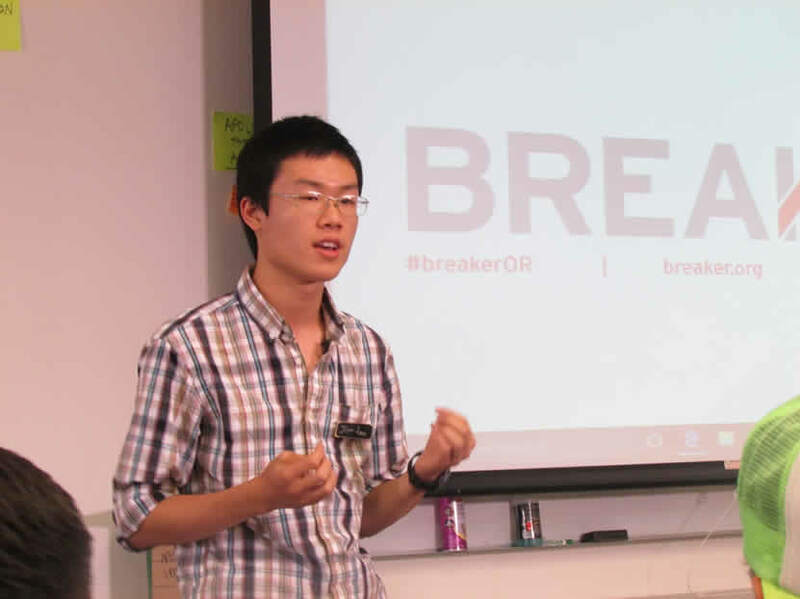 Breakers learned about “iteration” and were able to make changes on their prototypes and products based even further on the users’ needs. Wednesday was an exercise in business entrepreneurship, with Breakers posing the questions: How will it work? What are our key resources and who are our possible partners? How do we execute a business plan or pitch deck successfully? To help answer these, a follow-up visit from Eric Cress of UD + P excited students to have the chance to run their business ideas by him. Breakers identified value propositions and revenue streams, working from their research and local business leaders to build viability and sustainability into their solutions. By Thursday, students focused on constructing a narrative around the prototypes to create relatability. Vinh Mason, from Portland’s Bureau of Planning and Sustainability visited and presented his point for view, offering ideas and critical feedback for the three groups. Breakers created and rehearsed their pitch decks and Powerpoint presentations to tell the community about their product or service and why it matters. And finally, Friday the 19th brought us Pitch Day, an exciting gathering of industry-partners, community collaborators, and student breakers as they presented their services and prototypes. Cut/Paste, Green House, and VanGO shared their products with local, business leaders, entrepreneurs, and investors, gaining feedback, mentorship, and business connections.